Taiwan's presidential election is not exactly front-page news in the United States, or in the West more generally. One would be hard pressed to find coverage of it in any Western media outlets. "Who cares?" some readers may ask, shrugging their shoulders. Why worry about the domestic politics of an island on the other side of the world? Actually, they should care, as the election is crucial to the future of Taiwan. Indeed, who the Taiwanese people elect significantly affects the island's relationship with China, and therefore very much concerns American interests, which would be seriously threatened if a pro-Chinese candidate emerges victorious. During a tense period when Beijing is increasing its pressure and threats against Taipei, such an outcome would only embolden Chinese leaders, not mollify them. The ruling Democratic Progressive Party, or DPP, has postponed its primary to determine who will run on the ticket, to allow more time for an internal mediation process between the two leading candidates. The DPP said its primary will be held in May rather than April, if a mediation process to decide between President Tsai Ing-wen and former Premier Lai Ching-te fails. The plan was for the ongoing negotiations between Tsai and Lai to continue until April 12, and if no resolution was reached in that process, they would engage in a series of debates April 13-14, which would be followed by a public opinion poll April 15-17. Based on the results of the poll, the DPP had planned to name its 2020 presidential candidate on April 24. On Wednesday, however, the ruling party's Central Executive Committee decided to extend the period of negotiations and postpone the primary process until after May 22. The general election is set to take place on Jan. 11, 2020. As it turns out, the committee's decision came at a fortuitous time, when Maysing Yang, Taiwan's ambassador for democracy and human rights, was in Washington, D.C., to discuss the DPP's upcoming presidential primary at a small gathering. At the event, Yang said the United States must remain neutral during the primary, but then should support a pro-American candidate in the general election. Implicit in Yang's message is that some candidates running or considering running, all outside of the DPP, are sympathetic to China and less warm to the United States. Just look at Kuomintang, or KMT, the opposition party, which seeks deeper accommodation with China. The party effectively favors the status quo and eventual reunification, unlike the DPP, which supports eventual independence. Earlier this year, KMT chairman Wu Den-yih said that his party could sign a peace treaty with China if it regains the presidency. One member of KMT who is considering a presidential run, Han Kuo-yu, is especially friendly to China. He has even described Taiwan and China as partners in an "arranged marriage" who had fallen "madly in love." Perhaps he has not noticed the Taiwanese people's desire for sovereignty and China's threats to use military force to compel reunification. Han also recently visited Hong Kong and met with Chinese government officials. Beyond KMT, there are other possible candidates who are dangerously pro-Chinese. One is Ko Wen-je, the independent mayor of Tapei, who has said "the two sides of the [Taiwan] Strait are one family"—echoing Beijing's talking points. Ko has gone to remarkable lengths to avoid saying anything negative about China, and has effectively characterized Taiwan as a helpless victim in the face of Chinese aggression. "Why resist when it is hopeless?" he seems to be asking. Some may argue that seeking accommodation with Beijing is the right path for Taiwan to avoid war and reach a more fruitful relationship. There are two key problems with this argument. First, China is fully committed to reunifying Taiwan with the mainland. This fact will never change, no matter what Taiwan does. And if Taiwan bows to Beijing's will, it will be easier for China to destroy the island's sovereignty and democratic governance, bringing it under the Chinese Communist Party's brutal, authoritarian rule. Appeasement never works against imperial, expansionist, and murderous regimes. Second, China's military posture and heated rhetoric toward Taiwan has become more aggressive over time. These two ideas are especially true with Chinese President Xi Jinping, who has expressed a willingness to use his country's military against Taiwan and has tried to squeeze Taiwan through economic and diplomatic pressure. It would be the height of folly for a Taiwanese leader to believe that China is a friend, let alone family, and therefore warm to Beijing at the expense of the island's friendship with the United States. In Taiwan's current political environment, it is crucial that the DPP remain unified. Lai, an outspoken supporter of independence, has said he will support Tsai if she wins the primary. Tsai has not explicitly said whether she would do the same, but she shares Lai's desire for true independence. As I wrote recently, the United States has both moral and strategic reasons to assure Taiwan of American support, and to deter China from taking military action against the island. The problem is that current American policy toward China and Taiwan paralyzes the United States. In 1972, Beijing released its Shanghai Communique, stating its "one China principle" that Taiwan is part of China and would later be "reunified" with it—by force if necessary. Washington used the document to articulate its own "one China policy," which effectively endorsed China's position. Since then, the United States has sought to prevent China from attacking Taiwan while reassuring Beijing that Washington will not accept Taiwanese independence. Struggling to continue this balancing act, which has not stopped China from becoming more belligerent, the United States has no clear path to move cross-strait relations forward in any meaningful way. As Yang told me after the event on Wednesday, "the era of Nixon and Kissinger should end." That means killing this charade of balancing between a vibrant, democratic ally and an autocratic regime that poses the greatest long-term threat to American interests. Conflict is on the horizon if the United States continues its current policy. 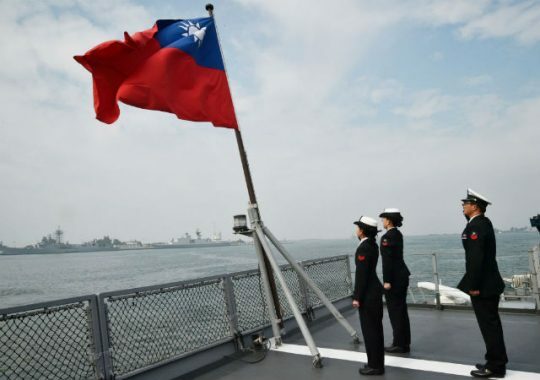 Reorienting its posture to focus on truly deterring China and truly supporting Taiwan is the best way for the United States to prevent bloodshed. But if a Taiwanese politician willing to submit to China becomes president in 2020, that becomes a much more difficult prospect. This entry was posted in National Security and tagged China, Taiwan. Bookmark the permalink.